An image that has already been debunked is being shared in Bangladesh to spread organ harvesting rumours. 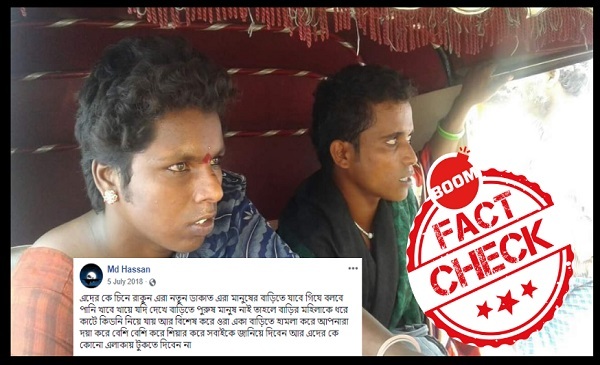 A photograph of two transgenders seated in an auto-rickshaw, has resurfaced on the timelines of several Bangladeshi Facebook users with a message that falsely claims two organ harvesters are on the prowl. The post, which has Bengali text urge people to be on the lookout for these two individuals. The post, which was shared by one Md Hassan in July 2018 has already been shared more than 8000 times. The most recent post is from January 14, 2019. BOOM found two other posts from January 2019, which may suggest the image is circulating once again. The caption reads like colloquial Bangla spoken in Bangladesh. This is not the first time the same image has been used to spread rumours online with life threatening consequences. It went viral in different parts of India last year with messages that falsely claimed the transgenders were child kidnappers. The photo first featured on Telugu website ‘teluguap2tg.com’ in May 2018. The incident happened in the Mahbubnagar district of Telangana, in May last year, when villagers chased and beat these two transgenders thinking them to be abductors. Read the story here. The image has also been debunked by Alt News in the past. The photo is part of a chain of Whatsapp forwards, rumours and fake posts, which circulated in India in 2017 and 2018 leading to the deaths of over 30 people in separate mob lynching incidents. The messages alleged that the child abductors not only kidnapped young children but also killed and harvested their organs. Rumours of child kidnappers on the prowl across Tamil Nadu, Kerala, Karnataka, Maharashtra, Odisha, Bihar and Gujarat were sparked by images and videos from unrelated incidents including a public safety ad from Pakistan that was maliciously edited. BOOM was the first website to debunk the video from Pakistan.